We had the good fortune of snagging two complimentary VIP passes to the Bruery’s 3rd Anniversary celebration at the Phoenix Club in Anaheim this past weekend. The Bruery is one of the heavy-hitters in the Orange County craft beer scene, which seems to grow exponentially every year, and they were fantastic hosts for both the beer-loves in attendance and the wonderful selection of California craft brewers that were guests for the event. General admission was $35 and came with 10 four-ounce tastings (with a cute little tasting glass). VIP had an additional five tasting tickets to be redeemed at their VIP tent, which served their limited edition brews. To be honest, I didn’t even get to use much of my VIP privileges, as the line was constantly long (although it moved at a decent rate) and there were just so many other stations that had no line at all that I wanted to try. Luckily, some of my favorite Bruery brews were available at their four other Bruery stations throughout the grounds. I was very impressed with the amount of guest breweries that were present in the Festhalle (19+ according to my count). 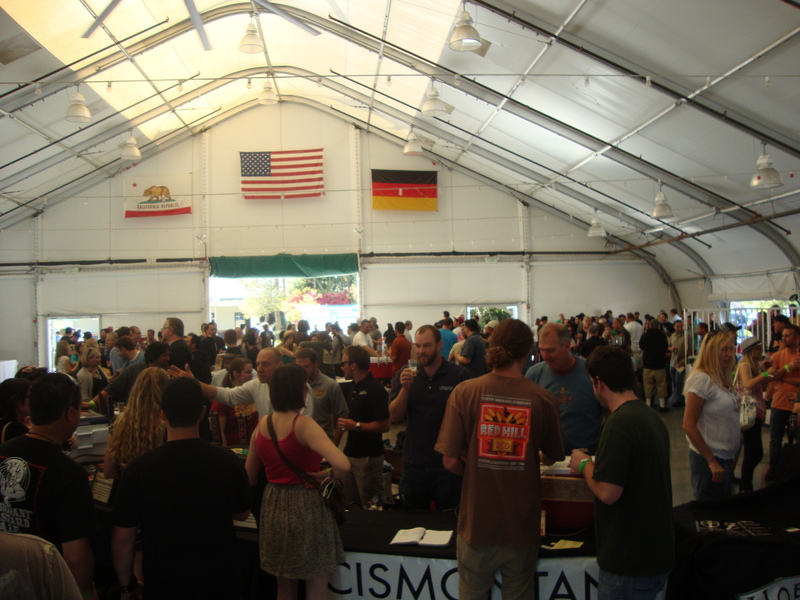 We were reacquainted with familiar folks like Firestone, Ballast Point, Stone, Eagle Rock, and Craftsman; and we got to know some fantastic newbies in the micro-brew world. Did you know that there was an Inland Empire Brewing Company in Riverside? I didn’t! And you know what, their Porter was pretty good. Other stand-outs include Cismontane, Ladyface, and Noble Ale Works, but I will go into a little more detail about the beers that we tried in another post. Along the lines of Bruery brews, there were three hits and two misses. Unfortunately, it was Ryan’s tastings that were misses. The ones I tried were great. I was absolutely thrilled to finally try their Salt of the Earth. A serious treat for the truffle lover. Earthy, well-balanced, and of course, salty! This German-style wheat beer is definitely not a beer you’d reach for at a party, but definitely one that pairs fantastically with food. I’m thinking seared foie gras, roasted duck breast, or even portabello mushroom burgers! The Orchard White was very clean and very drinkable. Nothing out of the ordinary for this one, but definitely one that you can nurse at a summer garden party or have while snacking on something light in the middle of the day. And of course, the Bruery’s Cuir. One of my personal faves, the Bruery’s 3rd Anniversary version of their Cuir is beautiful. It’s the kind of beer that wine-lovers (like me!) would love. Dark fruit, vanilla, notes of caramelized sugar, and….OAK! Complex, rich, and overall, a treat. I am so sad I didn’t get to try the special reserve version of this which is 100% barrel aged. This version, I think was 75% fermented in oak, and 25% in barrel. Overall: A great celebration! Beer pours were generous and ample, snacks were free-flowing (great cheese and crackers), people were mellow, parking was free, lines weren’t hectic, and check-in was a breeze. Cheers!